We are planning a surprise kitchen tea for a friend at the beginning of spring. The party will be held at the Pretoria Botanical Gardens, and this invitation is just right to set the mood for such a party. Fold the light purple cardboard in half to create a card 4.1" x 6", use the ruler to make the fold neat and smooth. Glue the 3.4" x 5.4" brown riffled cardboard to the front of the card, carefully ensuring that it is an equal distance from the edges. Now use the 3.4" x 5.4" dark purple cardboard. Leaving a space of 0.4" from the outer edges of this piece, cut out the inside so that you will have a dark purple "frame". "Frame" the brown riffled cardboard with the frame cut from the dark purple cardboard. 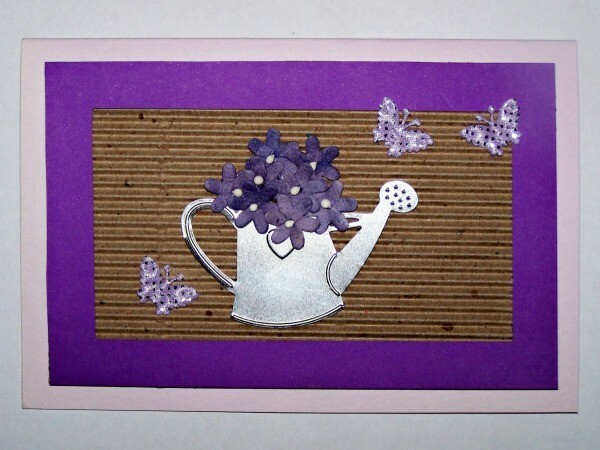 Glue the metal embossed watering can to the front of the card. Use a drop of glue at the back of each flower and "arrange" the flowers on the watering can. 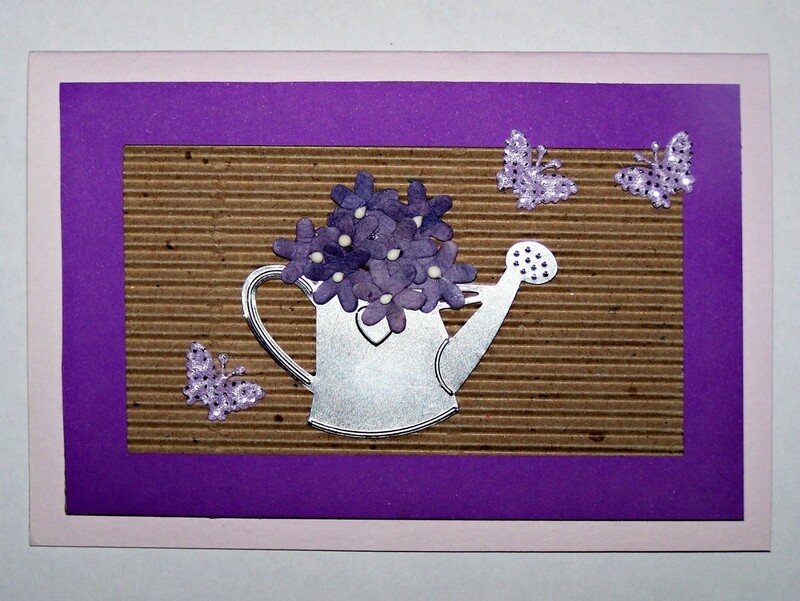 Add some glue to the back of the butterflies and position them on the card. Print a message on the white paper, cut it to the correct size and paste it to the inside of the card.